Beautifully maintained & updated home in & out, just minutes from the beach. 1-level, open floor plan features vaulted ceilings, updated chef's kitchen w/high-end appliances, 4BD/2BA. Hardwood flooring & Travertine tile throughout. Fabulous master retreat w/FP, spa BA & private access to patio. Great room w/corner rock FP, formal living/dining room w/FP. Neutral dÃ©cor, custom window treatments. Tranquil secluded backyard w/gorgeous patio, fruit trees. Custom oak entry door. Near schools, shopping & I-5., Fabulous family home ready for a turn-key move. Wonderfully upgraded single story 4 bedroom, 2 bath home with 750sq ft permitted addition for expanded living space. Located in a quiet neighborhood just a short drive to the beach. Neutral dÃ©cor throughout. Circular floor plan make this the perfect home for family gatherings, entertaining and holidays. Gorgeous updated exterior with stately Queen Ann palms trees and tropical plants, designer lighting and attractive landscape. The exterior front entry leads to the custom 42-inch solid oak door with operational side light for great cross breeze through the house. Step into the welcoming foyer where the warm tone of the engineered Italian hardwood flooring is accented with inlaid wood. Formal living room/dining room features a bay window, wood-burning fireplace with custom travertine surround and mantel. French doors in the dining room lead to side patio. At the center of the home are the oversized great room, spacious kitchen and casual dining area. Sweeping vaulted ceilings with 3 skylights bring a feeling of space and light. French doors to the back yard and multiple windows invite light and garden views. The corner wood-burning fireplace is finished in sandstone veneer. The hardwood flooring continues from the foyer into the great room and down the hallway leading to the bedrooms and office. The updated gourmet kitchen features new Statuario Quartz countertops, high-end appliances including a Thermador 5-burner gas stove with stainless steel downdraft, dual Kitchen-Aid ovens, SS Miele dishwasher & SS Kitchen-Aid built-in microwave. LG French door style refrigerator conveys with home. The white lacquered cabinets complement the 16-inch Travertine floor tiles and solid Quartz counters. Generous cabinet storage, work area and space for a moveable island. Meal plan, pay bills and more from the built-in desk at the far end of the kitchen. Enjoy cocktail hour, Sunday breakfast or mid-week dinner on the secluded side patio right off of the kitchen. French doors in the kitchen lead directly to the patio that can be protected from sun by a motorized shade. Unwind in the luxury master bedroom and spa bath. This 400+ sq ft room is open, airy and comfortable. Stylish Roman shades in natural fabric cover the windows. The dual sided gas fireplace with marble surround can be viewed in the bedroom and bath. 2 walk-in closets provide the ultimate his and hers storage. Private bath features jetted soaking tub with bay window, frameless glass encased sparkling white tiled shower, dual sinks. Private room houses commode. Excellent drawer space and cabinetry for toiletries, personal items and linens. Skylight invites natural light. French doors lead to the back patio & offer garden views. 3 good-sized bedrooms with mirrored wardrobes, neutral plush shag carpet and ceiling fans. Bedroom #3 has hardwood flooring. Lovely guest bath with updated tumbled marble tile, separate area for tub/shower and commode. Relax in the backyard Zen-inspired raised patio with privacy redwood fencing & stone benches. Custom window treatments throughout the home include elegant Silhouette blinds & shutters. Other upgrades include replacement windows, walls textured with a Venetian plaster application & bull-nose corners, recessed lighting, 6-panel wood doors and ceiling fans. Gas forced air heat and 2 AC units (bedrooms and the main living area). Plant shelves in great room & master. Indoor laundry accessible from the attached oversized 2-car garage. Reconditioned concrete tile roof meets local codes. Gutters. Ample storage can be found in the open rafters and cabinets. Workbench provides space for tinkering. Quality hand-built roofed shed with windows & shelving plus various smaller sheds and outdoor storage. Well-kept fenced in chicken coup. Enclosed vegetable garden with raised beds. Variety of fruit trees. Family neighborhood. 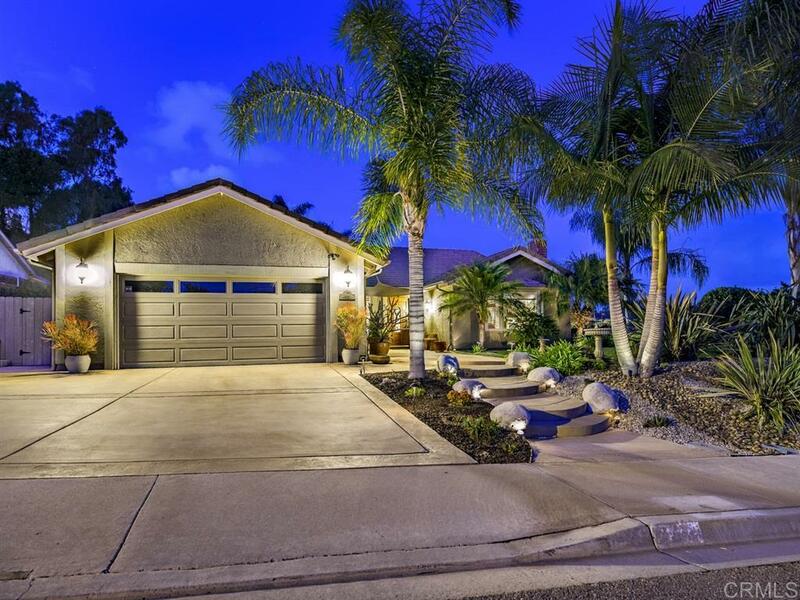 Highly desirable Encinitas Union/San Dieguito School District. No HOA or Mello Roos fees.